Tips to help your child gain extra nutrients. Children are cunning creatures, and many will do anything to avoid eating healthy foods. The mere mention of the phrase “it’s good for you” is enough to have your kids heading for the hills, so what is the secret to getting them to eat foods that are beneficial for their health? Read on for some tips to help your child eat healthily, and take the stress out of mealtimes. If your eating habits leave a lot to be desired, then it is easy to understand why your child may feel a little disgruntled at having to eat every scrap of broccoli while you are happily munching away on a chocolate bar. Ensuring your child is eating healthily is another way you show that you love them, so why not treat yourself with the same respect and eat the foods you want your child to eat. A little research into the long-term and short-term benefits of eating healthily will encourage you to change your family’s eating habits. Use sites like Examinedexistence.com to learn how health foods can boost brain power and refer to them whenever you feel like the battle for heathy eating is becoming too much. When you begin to wean your child onto solids, you will probably feed them pureed fruit and vegetables to begin with. At this stage it is probably simple to get them to eat healthy foods as they have no idea what you have whizzed up to form these mushy meals. However, introducing a toddler to fresh, healthy food options makes heathy eating a normal part of everyday life. As soon as it is safe and appropriate, let them feed themselves well-cooked broccoli, mushy berries, and ripened bananas. 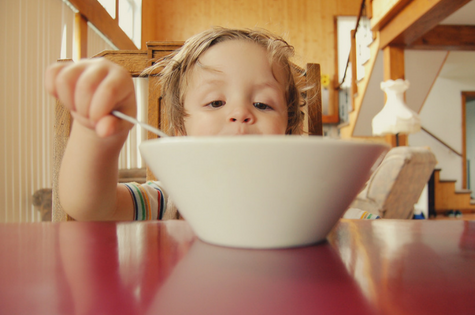 It may be messy, but for your child it is a fun learning experience during which they will learn to feed themselves healthy food choices and to know to stop eating when they become full. The word broccoli does not sound fun, but naming stalks of this vitamin-rich food trees instead could pique your child’s interest. Make faces out of their meals, and turn a fruit-plate into an exciting seascape of blueberries and kiwi, and a plate of vegetables into a field of peas, sweetcorn flowers and of course, broccoli trees. Food should be fun and making their plates attractive works of art made from healthy foods is something children will look forward to each meal time. If there isn’t anything unhealthy in the house then there is no chance of you giving into the tantrums of a child that just won’t quit until they get candy. It is never too late to change a habit, so even if you have only just realised that your child isn’t eating as healthily as they should, it is not too late to bin all the bad stuff and bring in all the good. If this is a new regime, prepare for a bit of a battle, but once the kids realise this is the way it is going to be from now on, the tantrums will stop and you will soon see the benefits. It may seem like a struggle at times, but even if your child begins to incorporate only a small amount of healthy foods into their diet, you will be glad you introduced a healthy eating regime into your home.